I currently own a 2004 Lincoln Town Car. i bough the car specifically for the smooth ride and comfortable seats. The driver and passenger seats have individually adjustable lumbar supports and they are simply wonderful. I am considering a late model LaCrosse or Impala or Taurus. I put a smooth, comfortable ride above handling and would like to get owner impressions. I am a big fan of the Taurus as I have owned all three iterations on the Volvo D3 platform - a Five Hundred, a Sable, and the current generation Taurus. My parents have a Lincoln MKS. My cousin has a 2004 Lincoln Towncar Signature, so I am familiar with the ride in that. I haven't tested either of the GM cars in their current incarnations - I've owned and driven a W-Body Impala and an Epsilon-II Malibu, and one would never describe their seats as comfortable. The seats in the Taurus at the top trim are like the seats in the Lincoln MKS. They are very comfortable. I drive in bumper-to-bumper commutting trafic as well as 5-7 hour trips to visit customers over the midwest. I have had no complaints. When driving with colleagues, they have wanted to take my car instead of theirs (an Acadia, a Dart, a Dodge Durango) citing ride comfort. The only thing I would change if I was maximizing comfort - with my current Taurus, I have the 20" wheels. I had the 18" wheels with my previous iterations. The 20" wheels make for a more "sporty" feel, so you will feel the ride more on broken pavement. The previous ones were more capable of swallowing the bumps on broken pavement. If you want to maximize comfort, go for the smaller wheels, or swap them with aftermarket wheels. Compared to the Town Car: A Town Car is its own kind of comfort. In the Taurus, you will sit much more upright. I believe Ford adopted this from their dalliance with Jaguar. When I get in a Town Car, I just have this sensation of sitting down into it with my feet straight ahead. You will be driving with your legs at a much more seated-in-a-chair position. It's not an SUV experience, as you don't step up into the seat. I like to sit upright more. One suggestion: Consider the Lincoln MKS. The used MKS is about the same price as the Taurus, and Lincoln made it just a little bit nicer in all the creature comforts. It is very smooth, even with 20" wheels. You can also get the EcoBoost V6 in the MKS. Can only speak about my 2008 Taurus: It's only the perfect sedan; comfortable to the max, totally adjustable leather seat/s. AND about those Impalas. Rented a 2014 model for a long roadtrip and would never rent or own another one unless they redesign the head rests that make it impossible to sit comfortably because your head is shoved forward no matter how you try to 'adjust' the seat and/head rest. Impala was otherwise comfortable but the trip turned into an endurance challenge. You cannot even turn the headrest 'around' to get the pressure off your neck. Going to be tough to find any vehicle that is as comfortable as your current Lincoln Town Car. The days of the large rear wheel drive sedans are gone. The boulevard ride comfortable large soft seats. All of the manufacturers have programs to cut weight. So most metal springs on seats are gone. Manufacturers now use just foam. Of course foam can be hard or soft. It seams though that most vehicle seats use a hard foam. Keeps the seat cover material whether leather or cloth from stretching. I have rented economy cars through luxury cars. All seam to have hard seats. And smaller seats to boot. Notice the huge center consoles in most cars now. With the huge center consoles comes smaller seats. Available are fancy seats with lumbar supports and power adjustments. But still small hard seats. I was in a new Porsche Cayenne SUV and the seat felt like I was sitting on a wooden park bench. I sat in a $60,000+ Cadillac Escalde - and the drivers seat was small and hard - with a hugh center console. So much for big SUV's. 2012 was the last year that customers could purchase any car with a split bench seat and column shifter. That was the 2012 Chevrolet Impala. There are no more cars with a column shift. I don't want any new car where my right leg rubs against the center console. You will be hard pressed to find one today without a huge center console. Although I have not visited many new car dealerships lately I did sit in a Toyota RAV4 that seamed to be comfortable for me. But that is an SUV and not a sedan. I currently drive a 2002 Ford Taurus SEL with column shift and leater seating. This is the most comfortable car that I could find/buy. Visability is an issue today as cars now have smaller backand rear windows. All of the sedan manufactures seem to make the rear/side windows smaller. Good luck finding a car with comfortable seats in today's market. Maybe look at full size pickup trucks. I own several cars including a 1998, Crown Victoria LX and a 2013, Ford Taurus SE. The seats are more comfortable in the Crown Vic, the ride is smoother than the Taurus. The Taurus however handles better. The Taurus has the 2.0 litre 4 Turbo. The rough ride most likelyare the tires whichI am replacing very soon. One of the best riding cars which alot of us want to drive is the Chrysler 300, with the V6. Lots of room very quiet on the highway. The handling is good but not sporty. I rented one for a trip and discovered the trunk is smalll for such a large car. The 300 still feels new after a year in service. Next is either the Buick LaCrosse or a Chevy Impala. The Buick seems tighter inside than the Impala both ride and handle very good but I give the nod to the Impala because of the larger trunk. 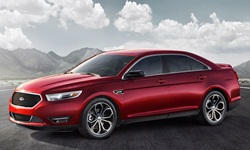 Finally the Ford Taurus, I said we own an SE but for the renatal company I usually the SEL or the Limited with the 3.5 non turbo six. What a difference between my SE and the Limited. The Taurus is the best handling of the bunch but that results in a stiffer ride.The seats in the limited are much more comfortable than my SE. Thetrunk is 21 cubic feet like the Crown Vic. All the cars I mentioned hold up well in a rental fleet. Other cars with comfortable seats and a quiet ride is the Toyota Camry, Nissan Altima. If I were to buy one of these cares I would pick the Chevy Impala first followed by the Taurus only because they have the larges trunks of any of these cars. There is a big differencebetween the low end model and the high endmodel in seat comfort and ride. The most comfortable seats are in my third cara 1987 Plymouth Voyager SE. The seats are old style with real cloth and springs. Don't forget the first generation GMC Terrain has a very long wheel base and ride very well. It also has Active Noise Cancelation.